The second presidential debate is next Monday, and I, for one, can’t wait. That’s when the gloves really come off and the Donald dukes it out with Hill-Bill for the Hill. Hey, Trump! Time to get substantive and stop with all your “I am the greatest” crap. Besides, you’re no Muhammad Ali. You’re more like Humpty Dumpty. Remember the nursery rhyme that begins:”Humpty Dumpty sat on a wall, Humpty had a great fall…”? 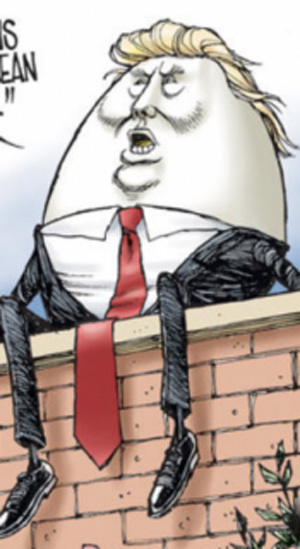 Humpty Trumpty wants a big wall. Humpty Trumpty’s gonna have a great fall. What kind of “great fall” will Humpty Trumpty have? A victory as P.O.T.U.S. or a plummeting at the polls? Humpty Dumpty and Humpty Trumpty have a lot in common. According to one legend, Humpty Dumpty wasn’t an egg. And Humpty Trumpty is certainly no egghead. Supposedly, Humpty Dumpty was a cannon. Well, Humpty Trumpty is a loose canon. You never know what he’s gonna say or do from one day to the next. Last Fall, in Iowa, he promised voters if elected he’d change his hairstyle. Must have realized: presidents don’t have time for origami. Recently, the Donald came to L.A. NOT wearing his “Make America Great Again” hat. It was in his hand. His war chest had dwindled down to a mere $1.3 mil. So some local mucky-mucks threw him a fundraiser. The amount top donors were asked to contribute was YUGE! $449k a couple. So what did they get for 449 thousand smackeroos? A photo with the Donald grabbing their check and a lousy dinner: Trump Steaks burnt to a crisp on a Kaiser roll. Choice of smashed potatoes or fallen angel hair pasta. A veggie medley of corn, cauliflower ears, and Wiki leeks. All the Brut Reserve from son Eric’s winery they could swallow. And for dessert, one of those fruit and whipped cream concoctions known as a Raspberry Fool. Two years ago July 21, 2014, Robin Williams left our Planet. On August 11,.